Over 65 million people around the world have been forced from their homes to escape famine, climate change and war in the greatest human displacement since World War II. 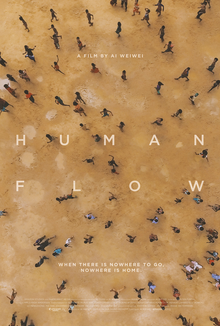 Human Flow, an epic film journey led by the internationally renowned artist Ai Weiwei, gives a powerful visual expression to this massive human migration. The documentary elucidates both the staggering scale of the refugee crisis and its profoundly personal human impact. Captured over the course of an eventful year in 23 countries, the film follows a chain of urgent human stories that stretches across the globe in countries including Afghanistan, Bangladesh, France, Greece, Germany, Iraq, Israel, Italy, Kenya, Mexico, and Turkey. Human Flow is a witness to its subjects and their desperate search for safety, shelter and justice: from teeming refugee camps to perilous ocean crossings to barbed-wire borders; from dislocation and disillusionment to courage, endurance and adaptation.